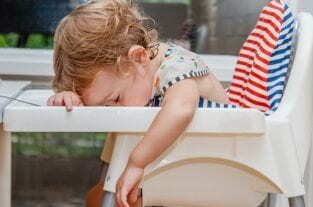 Toddlers don’t drink alcohol, but they seem to be wasted pretty much all of the time. They stagger into strangers, they cry for no reason, and they are often covered in puke. They’re like the drunken friend you don’t want to be left in charge of on a night out. They are whirlpools of destruction who will inevitably need putting in their place before bedtime. Sometimes, it might be hard to distinguish between the things you say to your drunken friend and those ridiculous sentences you are forced to utter to your toddler. The two are pretty much interchangeable. Whether you’re trying to persuade a ‘tired and emotional’ friend, who’s had one too many, not to go to another bar, or attempting to coax your grumpy, overtired toddler home from the park, you’ll probably find yourself using much the same arguments. Do drunken people act like toddlers, or do toddlers act like people who are drunk? It’s another of life’s great mysteries – up there with the chicken and egg debate. No! You cannot be naked here. It is completely inappropriate. We are in public. Pull your pants back up, we’ll go home, and then you can be naked. Ok? I mean it. Clothes on! Now. I’m serious. Don’t smile at me. Pants on! I’ve just stood on a tomato. Thanks for that. Look at this mess, there’s food everywhere. Well, I suppose I’ll have to clean this up. Are you ok? I think that’s going to turn into a nasty bruise. You scared me for a second then, but it could have been a lot worse. Let’s try to slow down a bit, ok? I know you like this song. It’s a great song, but we’ve listened to it on repeat for an hour now, and I just can’t listen to it again. Why don’t we have a different song now? Give me that! I can see what you’re doing. Don’t you dare put that song on again… What did I just say? Turn. It. Off. Oh, yeah, it would be great if we could buy all of those things but, um… I don’t have any money left. What a shame! I guess we need to call it a day and head home now, right? Crying won’t help. I don’t have any money, I promise! No! Excuse me, don’t go in my purse without asking me. Give it back, please. You’ll have to use your own money if you want to buy that rubbish. #6: What’s That In Your Hair? You have something sticky in your hair. Come here. Oh, God, it smells bad. What is that? Is it vomit? Food? Tell me what you put in your hair! This is seriously gross. You’ve smeared it all over my top. Thanks! Oh, God, it is vomit. Get me a tissue. Give me the phone back now – that’s enough photos. Look, half of them are blurry anyway. You’re filling my phone up with blurry photos of you with puppy ears. Stop it! Please give me back the phone. Oh, great… did you just post that on to Facebook? #8: Do You Even Know Why You’re Crying? Look, I’m trying to be sympathetic but I really have no clue why you’re upset. Please try to calm down. I know, I know, but I can’t tell what you’re saying when you’re still crying. Come on, take a deep breath and see if that helps. Ok, so what was it that made you cry? You can’t remember? Right … then why are you still crying? You don’t know?Ok. No! No more. You’ve had more than enough. You’ll be sick if you have another. Don’t look at me like that. You know I’m right. Yes, I am right. I’m not arguing with you about this. No more, and that’s final. No, not even a little one. Or half. No, none at all. It’s time to go. I’ve been looking everywhere for you. Did you sneak off while I was busy talking to that man? That was very sneaky and dangerous. What if something had happened to you and I had no idea because I didn’t know where you were? Honestly, I need eyes in the back of my head with you. Stay here. Don’t run off again, I’m just going to pop to the … Hey! Where did you go again? You just fell asleep in your pizza. You can’t nap here. Look at you… you have tomato sauce all over your chin! No, don’t lick it off. Stop that! And don’t fall asleep while I’m talking to you. Come on, we’re going home. Up you get. Say goodbye to that friendly man, and to your friends. That’s right, wave goodbye! We’re going home now. Yes, we are. Yes we are! Because I said so. I need to get home now. No, I can’t leave you here. You have to come with me. Because you do. Because it’s my job to keep you safe. Yes, it is. Yes, it is. Come on, say goodbye. I won’t let you speak to me like this. Just calm down and let’s talk about this. Use your words. Take a deep breath and then use your words. You can. Come on, what’s the matter? Are you feeling cross about something? No, don’t start shouting again. Take a deep breath and count to ten. Don’t even think about throwing that. Put it down. Sit down, and stop shouting at me. That behaviour is not ok. It is time to go home. We had a nice time but now it is time to leave. Would you like to come back again one day? Yes? Ok, then let’s leave nicely so that we can come back another time. They might not let us come back if they see how much of a fuss we make when we leave. Yes, I love you, too. Of course. Yes, even when you shout at me and cry and embarrass me. I love you all the time. Ok, that’s enough kisses now. Come on, let go – you’re slobbering all over my cheek. Next time you have a night out planned, be sure to take your ‘mum voice’ with you. Clearly, you’ll need it. Or warn your friends to take theirs – in case it’s you who turns into the drunken toddler after a few too many proseccos.